Press coverage about the Scottish Variety Awards featured in the Fife Free Press. 'Woven Tableware' Workshop at Unit Twelve, Sat 26th Nov, 10am-4pm. Start of Graduate Textile Artist Placement on the Making Moves/Birmingham City Council Residency at the Soho House Museum. 'Experimental Weaving' Workshop at Unit Twelve, Sat 22nd Oct, 10am-4pm. New Autumn stockists include the Heart Gallery, Platform Gallery, Sara Preisler Gallery, the Beetroot Tree and the Lunardi Gallery. For more information, please visit the stockists page. 'Introduction to Weaving' workshop at Unit Twelve, Sat 24th Sept, 10am-4pm. This experimental workshop explored basic twill, basket and hand manipulated weaves using 4 shaft table looms. To find out more and see the pictures, please visit the Lauren Crawford facebook page. Selection of Back to Floats Scarves on display at new retailer in Suffolk, called Smiths Row. Please see the stockists page for more info and contact details. Exhibited at the 'Born to Play' event on Saturday 13th August at Stafford Cricket Club. Studio opening at Unit Twelve on Saturday 7th May, 4.30-6.30pm. Originally based in Fife, the Lauren Crawford studio is now located at Unit Twelve in Stafford. Unit Twelve is a contemporary craft exhibition and workshop space, based in a converted cow shed, in a beautiful rural location. Unit Twelve has 5 open plan studios which are home to Jennifer Collier (curator and owner), Jo Hill, Helen Roberts and Abbey Costello. Unite Exhibition. A showcase of 38 makers who unite, inspire and champion Scottish Craft. The exhibition takes place at the Collins Gallery in Glasgow and runs from the 16th April-7th May. Lauren Crawford wins PSYBT Jolomo Arts and Crafts Award. Having made it to the finals as one of seven short listed businesses, it was an honour to receive the 2nd prize of £1500! The awards were held in the Kranenburg Fine Art Gallery in Oban on Thursday 17th March. First prize went to Judith Clark and third to Genna Delaney. First round of new stockists for 2011 include DK Owen, Kirkcaldy, Maida Veil, Peebles, Neo Design, Dundee and Sixpenny Blue in Symington. Please see the stockists page for further details. Featured in the Courier and All Media Scotland. Articles outlined Laurens recent success as a finalist for the PSYBT Jolomo Arts & Crafts Awards 2010. To view the articles, please click on the links below. Selected by craftscotland to exhibit a selection of hand woven scarves and corsages for the pop-up shop to be held at Letham Nights at Letham Village Hall in Fife. Letham Nights aims to bring high quality music to Letham and provide a stage for local talent. The pop-up shop will take place on the evening of Saturday 18th December. New stockists include Brazen Studios, Glasgow, The Silk Top Hat Gallery, Ludlow, The Compass Gallery, Glasgow, Dundee Contemporary Arts, Dundee, Fibre and Clay, Knutsford and the Maissonette, Glasgow. Selected by Craftscotland to exhibit works at the pop-up shop to be held at Letham Nights at Letham Village Hall in Fife. The event will take place on the evening of Saturday 6th November. Hand woven pieces for sale include my new range of luxurious corsages and skinny scarves. Short listed for the PSYBT Jolomo Arts & Crafts Awards 2010. Seven PSYBT businesses have been selected to attend the finals taking place on Thursday 9th December at the Kranenburg Fine Art gallery in Oban. Please visit www.psybt.org.uk to find out more. Maker of the Month at Concrete Wardrobe, in Edinburgh. 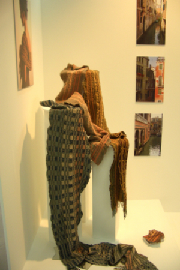 Throughout September, the new luxurious collection of hand woven scarves and corsages were exhibited. Exhibiting at the Balgeddie House Hotel Wedding Fair on Sunday 9th May, 12-4pm. Exhibiting at the Shop within the Show at Designer Crafts. Designer Crafts is held in the Mall Galleries and is open from the 9th-17th January. Presentation and talk to the Peebles branch of the Embroiderers Guild. After completing the Starter for 6 training programme, Lauren Received funding from NESTA, The National Endowment for Science, Technology and the Arts. Exhibiting at Designer Crafts, 2009 at the Mall Galleries, London in January. Placement at Salt, London. A contemporary design practice creating hand woven fabrics for window treatments and interiors. Exhibiting at One year On at New Designers. One year On is held in the Gallery Atrium of the Business Design Centre and is open from the 3rd-6th July. Selected by Creative Fife to exhibit at the British Craft Trade Fair in Harrogate, from the 6th to the 8th April. Work experience with Andy Ross at ASF Shetland. My placement included presenting a introductory weaving workshop at the Centre for Creative Industries, Yell, Shetland Islands. Winner of the Small Grants for Makers Scheme. 2007 Product range launched at the Christmas show in the Compass Gallery, Glasgow. Appointed the Designer in Residence position at Duncan of Jordanstone, College of Art and Design, Dundee. "DIRECTION is where fashion begins!" Asked to display works at Aberdour Arts Festival. Received sponsorship from Hearts Desire. "10 days of celebreations with arts, crafts, song, dance, puppetry, sports and so much more." Exhibited work and held a textile workshop for pupils and puplic members. Also asked to talk about my work during the festival events.